Give Your Walls Personality with Art.com! I used to have a huge blank spot on my wall that was just begging for something to fill it. Thanks to Art.com for providing the gorgeous piece of art to make it more beautiful and show off my personality! All opinions, of course, are my own. As I mentioned above, I’ve been staring at this big blank spot on my living room wall for like three years now. See, when we moved in, we were only planning to stay for about 6 months, so we never really did much decorating. Six months turned into a year, into two then over three. While we still “plan” to move as soon as possible, I’ve decided that I’m done living like I’m just here temporarily. Basically, I want things to be more homey, so I’ve been doing a lot more decorating over the last months. When I saw the Read to Imagine print, I knew I had to have it! First, let me say that it is impossible to take a picture without getting the glare and reflection. I’ve tried it with flash, without, with light, without. Still, it gives you a good idea of how big and beautiful this print is, right? It came in a gorgeous black frame that really made the details in the tree stand out! It took me only a few minutes to find a print that I loved on Art.com. 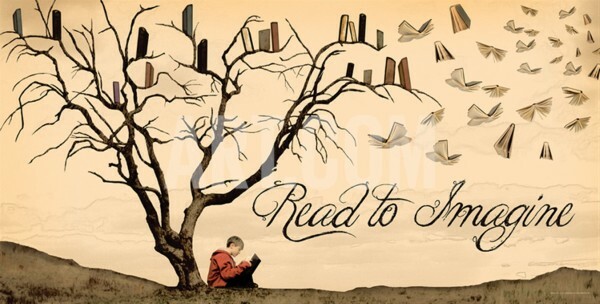 I knew I wanted something that showed off my love of reading. So I just typed “reading” in the search bar. It dropped down some suggestions, and the Motivational sounded like a good place to start! 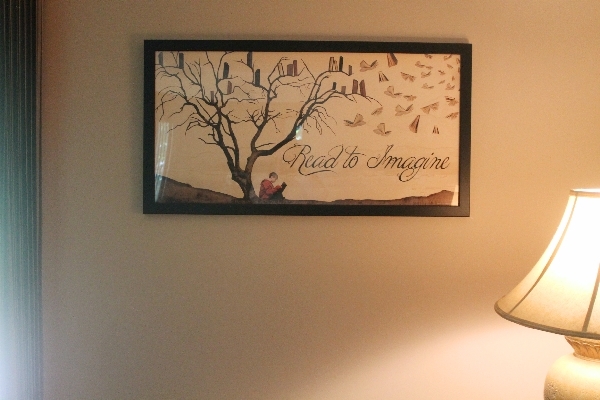 Once there, I saw the Read to Imagine print and knew right away that it’s the one I wanted! However, I realize that maybe some aren’t as decisive as me when it comes to art, so I searched around to get an idea of some of the other great offerings! It’s so easy to search the site because they have a ton of easy categories. I found this gorgeous piece in the Fantasy category! 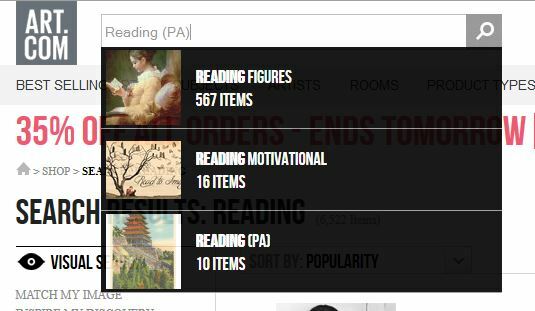 One thing I love about searching on Art.com is that you can add your favorites to your gallery. Just sign up for a free account, either with Facebook or your email. 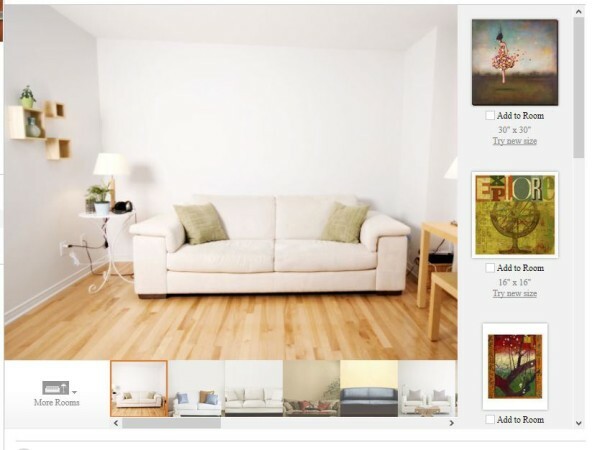 Create a gallery (or many, if you want to categorize) and start adding as you browse. You can either add from the product info page or from the quick look that pops up when you put your mouse over an image. 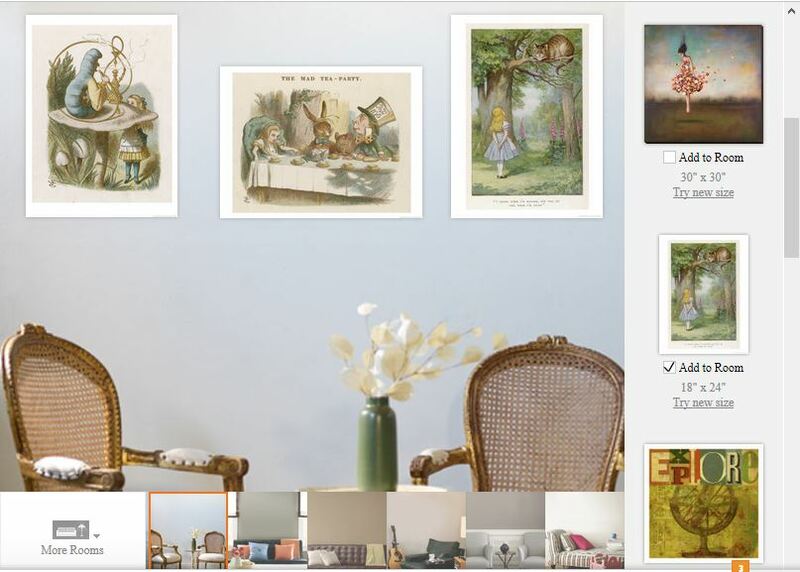 In your gallery, you can view a slide show, share your gallery or even see how each print would look in a room! I love this feature because you can add as many pieces as you want and move them around. It’s so much fun! I made an Alice in Wonderland sitting area! This feature alone would amuse me for hours! Whether it takes you five minutes or five hours to find the perfect piece, ordering itself is a breeze. If you just want to go with the print, you can add it to the cart and check out. But let’s just say you want to frame it. Simply hit the giant “Frame It” button! From there, you can choose different frames, mat options and more. 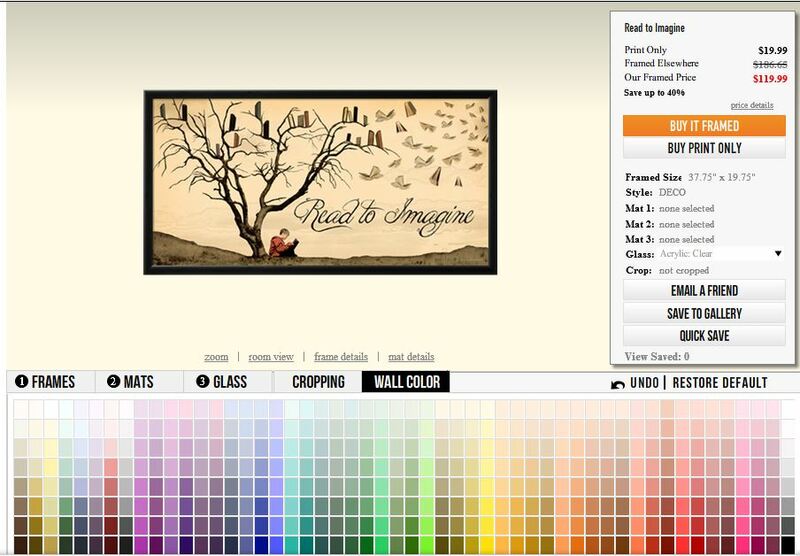 You can even choose the color of your wall to see how the frame would look on it. Once you’re satisfied, just finish checking out, pay for your order and wait for a big box that says Art.com to arrive on your front door! Everything from the browsing to the finalizing is such a fun experience! I love that they also tell you about coupons and specials right on the front page, so you don’t have to go digging. With such a huge variety of prints in every budget, you’ll find something you love to show off your personality! What is your favorite style of art for your wall? Who is your favorite artist? You can also use double frame hangings, it will increase the interior coherence! Buying art has really come along way with sites like this! I like photography on my walls personally. That’s a great print. I’m a big reader and appreciate the quote and art. I love this print! It would make an awesome gift for my friend who is a librarian. I personally love looking for just the right print. You always know when it’s the one. I don’t really have one favorite artist. I do like a lot of Wooster Scott’s work. These are so gorgeous! I don’t have much artwork in my house and need to change this!